Hello! 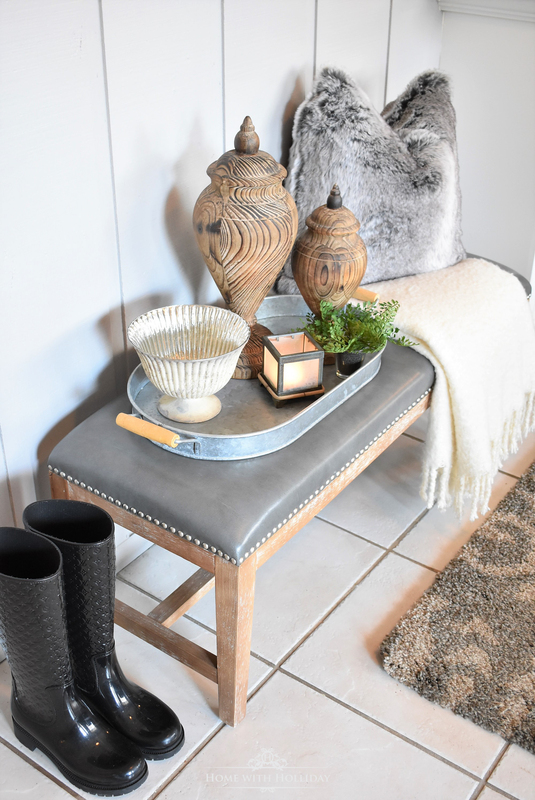 Last week, I posted Part One and Part Two of my 3-part series with tips on styling a bench or ottoman six different ways. Last weekend, I was sitting in my living room and felt like the bench in that room needed some love. This was the inspiration for this series. In the first two posts, I featured four themed designs to provide a variety of different looks for the bench that sits in front of our fireplace. Click on the links below to see the looks. All of that fun leads me to another bench in our sunroom (soon to be a laundry room, mud room, and workroom) that also needed some happiness. This bench (from HomeGoods) sits to the right of the door I come in from my garage. I have a two-car garage (that will become another family room in Phase 4 of our remodeling projects) and then my husband has another 3-car garage that has a separate entrance to the sunroom. PLEASE keep in mind that the only thing I have done in this space is painted it and add some temporary furnishings as it will soon be gutted! With that being said, the bench that sits here has become a landing spot for a myriad of my things. I will drop my shoes, my keys, phone, handbag or shopping bags on any given day. So, I decided to give it some upgrades. Now, it makes me so happy now when I walk in the door! In Part One and Two of the series (click here to see), I shared these tips to help create these looks. There is a simple formula you can follow to implement this kind of styling on your own. These basic recommendations also work well for a coffee table, sofa table or buffet styling. In this space, I once again started with a grey bench, albeit with a completely different look than the bench in my living room. Since the sunroom is primarily “my space”, this first look definitely has a feminine feel and ties in some of the other blush tones I have used in this room. The batten board paneling on this wall is painted a light grey color to oppose the white tile (not fond of it at all!!). This is precisely why I laid a large area rug in this area to soften all the white flooring. Now that these accessories have been added to the bench, leaving my shoes here makes more sense. I constantly use my Ugg slippers to go in and out of my house and my pink velvet, Gucci shoes are one of my go-to’s for the spring. I am absolutely wearing them out! They are on sale right now on Bluefly. It was worth it to me to use fresh flowers here since this is the first thing I see when I come inside from the garage. However, I made sure to choose flowers that will last a long while. Natural greenery, baby’s breath, and Alstroemeria are perfect for this arrangement since they will hang in there for weeks as long as I keep the water fresh every couple of days. I bought this adorable compote for my centerpiece for my recent Galentine’s Party, and I thought it was perfect for catching all the little things that come inside with me. It is presently holding some of our keys. Considering the pre-existing batten board walls in this room, I felt like it would be fun to try a farmhouse look. As in the last two posts, I only used accessories I already had in other areas of our home. I started with the galvanized tray I use for outdoor entertaining. The pair of wood finials were a great fit here because of their rustic feel. They are constantly moving around my house! I used the same compote again as it is a great catchall for keys, etc. The ivory throw and grey faux fur pillow add some nice coziness especially since it is still winter here in Denver. Thanks to the tile floors, this area collects a lot of wet shoes, especially when it is snowing. Isn’t this just the nicest landing spot for my favorite Louis Vuitton Rain Boots?! This bench also became a landing spot for another very special family member! She just couldn't stand to not be in the middle of the photo shoot! 🙂 She is such a little photo bomber! Thanks for stopping by today, especially if are visiting from one of the two other posts in this series. 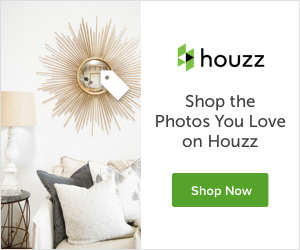 My hope is that some of these tips will help make your decorating easier or just give you new ideas about how to re-purpose some of your accessories! Try a couple of different looks yourself...I promise it will be fun! Beautiful bench ideas. I just purchased my first bench to use as a coffee table, it was nice to see some different ways I could decorate it. Oh, Leanna, I am so glad you liked it! I would love to see what you end up doing!! Have a great weekend! Love this bench styling and those pink shoes are fab!!!! I’m from Dallas too, also living out of state now. Oh, how fun! I miss home because most of my family is still there. I do most of my shopping there though so I get back there often. I bought the Gucci shoes at the Northpark Neimans, which I am sure you are very familiar with!! 😉 Have a great weekend! Thank you so much Marissa for letting me know! I will get that fixed right away. Thanks for stopping by!! Oh my gosh, your bench and all your decor are fabulous! Oh, and I adore your little furry photo bomber! Thanks so much for sharing this fantastic post over on our Friday Friends Parade Linky Party! Janine, coming from you, that is such a nice compliment! Thank you so much! I will certainly join the party again! !